DNA, deoxyribonucleic acid, is the genetic material of organisms and is responsible for the transmission of hereditary characteristics, e.g. eye and hair colour. Many disabilities and illnesses, including some cancers, can also be linked to your DNA. Finding the structure of DNA was the first step to understanding how these features are transferred from parents to offspring. 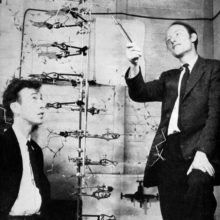 Francis and Jim were working on solving the structure of DNA in the MRC Unit for Research on the Molecular Structure of Biological Systems (now the MRC Laboratory of Molecular Biology). 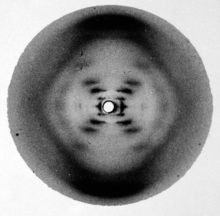 Using experimental data, especially X-ray diffraction photographs from Rosalind Franklin and Maurice Wilkins at King’s College, London, they began the process of model building. They showed how the different components of DNA interact in three dimensions to form a long spiraling molecule, with a double ‘backbone’ of sugar and phosphates. Nitrogen-containing compounds, called bases, protrude from the two halves of the backbone and link together in pairs, so the whole molecule is like a zip. This is known as the double helix. The four types of bases form a sequence along the DNA, and this is the ‘genetic code’ from which the whole body develops. The discovery immediately suggested the way in which DNA is replicated: the two strands are ‘unzipped’ to allow the ‘code’ of bases to be copied. “It is this specific pairing between bases that is the heart of the replication process”. 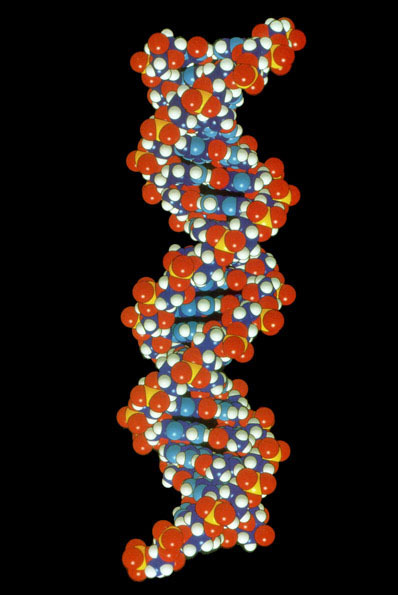 The unraveling of the helical structure of DNA is hailed as one of the most significant landmarks of the 20th century. Scientists have been able to build on this basic knowledge of DNA, by applying it to issues of health and medicine, e.g. identifying ‘faulty’ genes, such as the cystic fibrosis gene and the BRCA1 and BRCA2 genes implicated in some breast cancers. Francis and Jim shared the Nobel Prize with Maurice Wilkins.